The Brazilian state of Tocantins is the latest hotspot for soy- and cattle-related deforestation. In 2018, more land was cleared there than in any other state of the Brazilian Cerrado, a large tropical savanna biome that covers more than 20 percent of Brazil. Overall Cerrado deforestation rates have declined in recent years, but Tocantins continues to see high rates of forest loss. Soy sourced from Tocantins carries a high risk of being connected with legal and illegal land clearing. A close monitoring of the implementation of zero-deforestation commitments may mitigate risks for traders, investors and end-users of agricultural commodities from Tocantins. In 2018, more forest was cleared in Tocantins than in any other Cerrado state. Tocantins is a sparsely populated rural state in central Brazil. Tocantins deforestation of 153,320 ha contributed to 23 percent of total forest loss in the Cerrado in 2018. The soy and beef markets drive deforestation in Tocantins. Soy plays a key role in the Tocantins’ economy, due to a favorable climatic and political environment. Between 2008-2017, 947,287 ha of natural forest formations were transformed for soy cultivation and livestock pasture. The key supply chain actors in Tocantins are cattle ranchers and soy traders. The largest private landowners in Tocantins are active in the soy and livestock sectors, and they are often involved in local and national politics. All major soy traders operate in Tocantins. Soy sourced from Tocantins carries a high risk of being linked to legal and illegal deforestation. 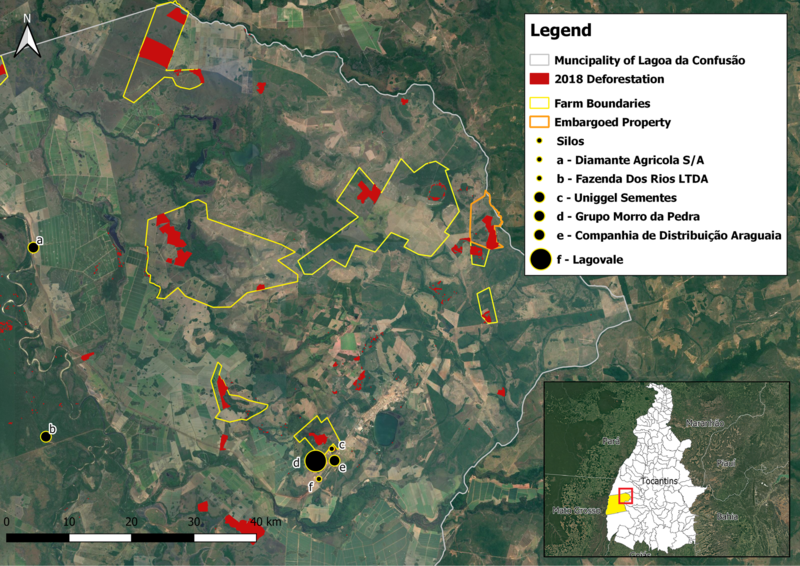 Case studies reveal that soy production in the municipalities Lagoa de Confusão and Campos Lindos may be linked to illegal deforestation, environmental fines, embargoed areas, land disputes, and slave labor. Glencore and Cargill are the main soy traders in these municipalities. Cattle from deforested farms could be linked to JBS’ and Masterboi’s slaughterhouses. Key soy traders, including ADM, Bunge, Cargill, Louis Dreyfus, and Cofco, and major beef retailers, such as Carrefour, Cencosud and Casino/Grupo Pão de Açucar, may therefore face elevated deforestation risks in their supply chains. Strengthening zero-deforestation commitments and their strict implementation may mitigate such risks. This could include disclosure of supply chain data, indirect supply chain tracking, stricter enforcement of non-compliance mechanisms, and continuous monitoring of land use change, both legal and illegal. Tocantins, located in central Brazil, is the country’s youngest state. Initially part of the state of Goiás, it became a separate administrative entity in 1989. The entire state is part of the region known as Matopiba (consisting of the states of Maranhão, Tocantins, Piauí and Bahia) (Figure 1). With a population of 1.56 million (the 24th most populated of Brazil’s 27 states), Tocantins is mostly rural and sparsely populated. Agriculture and livestock account for 53 percent of the state’s land use (14.8 million ha out of the total 27.8 million ha). 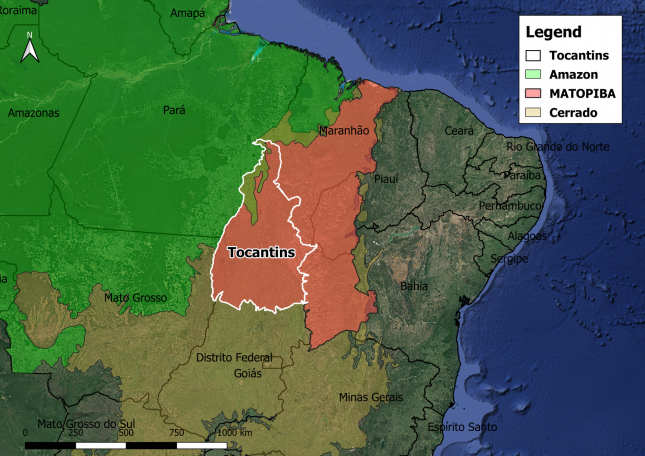 Eighty-eight percent of Tocantins falls within the Cerrado biome, a large tropical savanna biome that covers more than 20 percent of Brazil. The remaining 12 percent of the state falls within the Amazon biome (Figure 2). Tocantins’ state government favors large-scale soy and livestock production. The soy industry enjoys several tax benefits related to agricultural inputs and soybean derivatives. Moreover, the fertilizer industry enjoys an 85 percent reduction on sales tax and does not pay import taxes on raw materials and inputs. Also, the state has implemented several large-scale agricultural development plans in the last two decades. On a local and national level, farmers-turned-politicians have favored the interests of the farming sector over forest conservation. One of the most prominent among them is Senator Kátia Abreu, who originates from Tocantins and was Brazil’s Minister of Agriculture in 2015 and 2016. She is allegedly in favor of Chinese investment in the beef sector. The current governor of Tocantins, Mauro Carlesse, lobbies for maintaining the exemption from the Tax on the Circulation of Goods and Services (ICMS) of grains produced in Tocantins for export. In 2018, more forest was cleared in Tocantins than in any other Cerrado state. Some 153,320 ha were deforested, which was 23 percent of the total forest loss in Cerrado states (Figure 3). At 2,500 ha in 2018, forest loss in the Amazon area of Tocantins was relatively low. This amount was 19 percent less than the previous year and accounted for 0.3 percent of total Amazon deforestation. Deforestation is widespread throughout Tocantins. The municipalities Pium, Dois Irmãos do Tocantins, Rio Sono, Paranã, Santa Rita do Tocantins, Lizarda, Goiatins, Lagoa da Confusão, Formoso do Araguaia, and Dueré had the highest deforestation rates in 2018 (Figure 4). Over 55,000 ha of native vegetation (36 percent of the total deforestation in the state) were cleared in these municipalities in 2018 (Prodes and GLAD). Between 2008 and 2017, a total of 947,287 ha of natural forest formations were transformed for agricultural use and livestock (Figure 5). As in other regions in Brazil, the main drivers of this deforestation are soy, cattle and land speculation. Whereas most forest is converted into livestock pasture, a significant area of pasture is subsequently transformed into soy farms. This activity is illustrated by the fact that between 2008 and 2017, 248,969 ha of pasture were converted into agricultural land. This represents 34 percent of all current agricultural land. 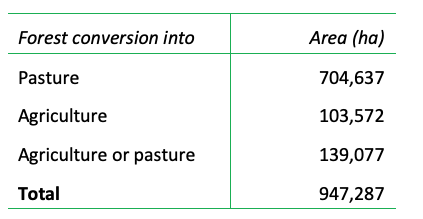 As such, forest conversion into pasture, as presented in Figure 5, may still be linked to soy production that takes place several years later. Soy plays a key role in Tocantins’ economy and is by far the most important crop. Since 2008, the area planted with soybeans in Tocantins has almost tripled (Figure 6), although expansion has been limited between 2015-2017. In 2017, soybeans covered 842,160 ha in the state, representing 71 percent of all land used for agricultural crops. Tocantins produced over 3 million metric tons of soybeans in the harvest year of 2017/2018. In 2018, soybeans accounted for an estimated 83 percent of the state’s total exports, followed by beef (9.7 percent). The second most important crop was corn, which is often used in rotation with soy. Tocantins has favorable agricultural and climate conditions for soy cultivation. Well-distributed rainfall patterns, fertile soils, absence of slope and altitude restrictions, and the existence of large tropical floodplains allow for multiple harvests each year. The Agricultural Defense Agency of Tocantins (ADAPEC) told CRR in December 2018 that the favorable conditions for soy cultivation explain its expansion. Along the North-South rail- and highway (to Itaqui port in Maranhão), including the municipalities of Peixe (6.2 percent) and Porto Nacional (4.9 percent). The ten largest private landowners in Tocantins own a total of 2.7 percent of all registered property (Figure 8). 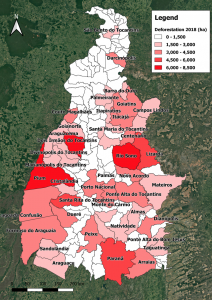 However, most of Tocantins is public land, and Incra Superintendencia Estadual Do Tocantins, the Brazilian public agency responsible for allocating rural settlements, is its largest landholder (168,805 ha). In Brazil, public land is particularly vulnerable to practices of land grabbing and deforestation. Seven of the ten largest known private landowners have cleared 2,396 ha of native vegetation in Tocantins in the last two years. The Brazilian Ministry of Environment classifies more than half of the vegetation as forest. The other 1,121 ha of Savanna Grassland and Savanna Park can be considered grassland formations. The major economic activities of these private landowners include cattle, soy, and logging (Figure 8). The largest private landowners in Tocantins are active in the agriculture and livestock sectors, and they are often involved in local and national politics. Marcelo Henrique Limírio Gonçalves, the single largest private landowner, appears in the Forbes List of Brazilian Billionaires. He and his family, who acquired most of their fortune in the pharmaceutical sector, allegedly have relationships with high-ranking politicians. Gonçalves owns 20 companies, of which twelve are in Goías, five in São Paulo, two in Tocantins, and one in Mato Grosso. In Tocantins, he and his son own Agropecuária Limirio Goncalves Ltda in Lagoa do Tocantins, with the farms Fazenda Serra Azul and Fazenda Serra Dourada. Soybeans and other grains are cultivated on both properties. Moreover, he owns a large cattle farm (Fazenda Rio Verde) in Araguaçu. Naçoitan Araújo Leite, a local political leader (mayor) in Goías, is associated with abusing political power and improper campaigning. His name appears on the list of embargoed properties of Brazil’s Environmental Protection Agency IBAMA, for deforestation in a conservation area (Serra Geral do Tocantins Ecological Station) in Tocantins’ municipality Almas. He owns two companies: Comercial Leite de Produtos Veterinarios Ltda (veterinary pharmaceuticals) and Etiel Planejamento e Consultoria Agropecuarios EIRELI (consultancy services for agricultural and livestock activities). Considering the companies’ activities, he is likely engaged in both cattle and agricultural production. At least four of the major private property owners are involved in cattle breeding. These owners include Javaes S/A Agropecuária (in municipality Pium), Fazenda Vista Alegre SA (Araguanã), Agropecuária Santa Mariana Do Tocantins Ltda (Araguaçu), and Agropecuária Morro Branco Ltda (Novo Jardim). The other private property owners on the list are engaged in various agricultural activities, including logging, soy, rice and eucalyptus. Eco Brasil Florestas SA is a logging company in Araguaína for wood and pulp, and Agropecuaria Paranatins Ltda’s main economic activity is soy cultivation. Companhia Brasileira de Agropecuaria (Cobrape) is involved in rice cultivation, cattle, and eucalyptus plantations among others. 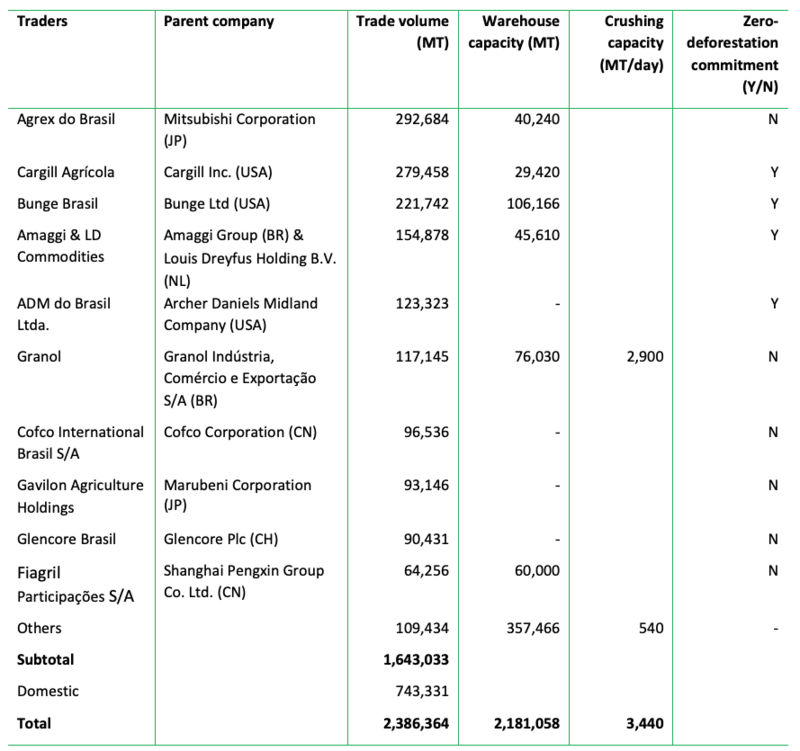 ADM, Amaggi, Bunge, Cargill, Cofco, Louis Dreyfus, and Glencore are among the soy trading companies active in Tocantins (Figure 9). Agrex do Brasil S/A, a Brazilian agribusiness company and subsidiary of Mitsubishi Corporation, was the largest soy trader in 2017. Its market share makes up 18 percent of the total 1.6 million metric tons of soy traded in the state (without domestic consumption). Cargill (17 percent) and Bunge (13 percent) rank second and third respectively. Bunge has the largest warehouse capacity in Tocantins, with 106,166 metric tons of storage capacity divided over five facilities (Campos Lindos, Cariri do Tocantins, Guaraí, Pedro Afonso, and Porto Nacional). Glencore, Granol, CHS, Agrex, Fiagril, and Cargill are the lead traders in soy municipalities (over 20,000 ha of planted soy area) with the highest deforestation rates (Figure 10). These companies may be most exposed to financial risks related to deforestation in Tocantins. Soy crushers in Tocantins are a potential source of leakage for unsustainable soybeans. All soy crushing capacity in Tocantins is in the hands of three Brazilian companies that have no commitments to eliminate deforestation from their supply chains. Granol’s industrial unit in Porto Nacional is the largest crusher operating in an area with high deforestation rates. 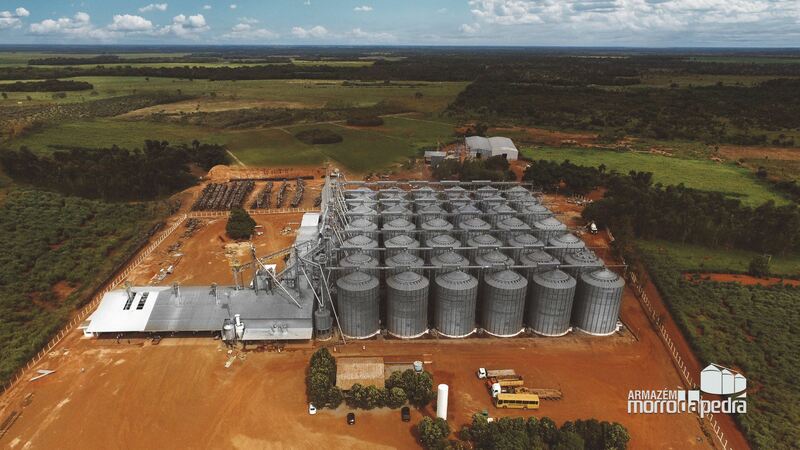 Granol Indústria, Comércio and Exportação S/A, founded in 1965, is engaged in production and commercialization of beans, soybean meal, vegetable oils, and biodiesel in Brazil and internationally. The Porto Nacional unit expanded its biodiesel operations with soybean crushing in 2015, with a crushing capacity of 2,900 tons per day. Granol’s soy warehouses in Aguiarnópolis, Figueirópolis and Guaraí predominantly supply the processing unit in Porto Nacional. In June 2016, the Granol processing unit was temporarily out of operation, due to a domestic shortage of soybeans and vanishing profit margins. A second soybean crushing plant Nutrifico, owned by Grupo Focoagro, was inaugurated in the municipality of Guaraí in October 2017. With a soybean crushing capacity of 160 tons per day, it is relatively small. Fazendão Agronegócio owns the third soybean-crushing unit in Cariri do Tocantins, with a capacity of 380 tons of soybeans per day. Lagoa da Confusão is among the main soy-producing municipalities and is one of the areas most affected by deforestation in 2018. Lagoa Da Confusão produced 121,432 metric tons of soy on 40,130 ha of land in 2017. A total of 4,127 ha was cleared in in 2018 (Prodes and GLAD), of which 40 percent was classified as “Alluvial Semi Deciduous Seasonal Forest” and 13 percent as “Forested Savanna” by the Brazilian Ministry of Environment. The remaining 47 percent consists of grassland formations. Sixty-eight percent of the municipality is protected as a national park. Soy and rice are the key agricultural crops grown, in a rotational system. 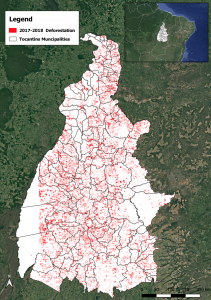 Soy producers and warehouses are highly concentrated in the northeast section of the municipality (Figure 11). With 68,690 metric tons of capacity, Grupo Morro da Pedra owns the largest warehouse facility in the municipality (Figure 12). Its founders and their family own 43 properties (12,415 ha) in the municipality and directly next to its border. Glencore is the largest exporter of soy from Lagoa da Confusão. The company accounted for 82.9 percent of the total soy exports in the municipality in 2017, with volumes mainly shipped to China. At least one farm in Lagoa de Confusao has foreign investors. The U.S.-Brazilian joint venture is an investment of the Harvest Capital Group LCC, founded in 1996 by “two farmer families who wanted to invest in agricultural production in South America seeking for cheaper land.” Harvest Capital invested USD 32 million in Fazenda Dois Rios Farm in the municipality. Illegal and legal deforestation took place in Lagoa da Confusão in 2018. Twenty-six percent (1,077 ha) of the 2018 deforestation took place on 5 different farms shown in Figure 11. One of these farms (Fazenda Macaúba) is recorded in the IBAMA list of embargoed areas. Forty-eight properties in the municipality, totaling 2,583 ha, are under embargo by IBAMA. 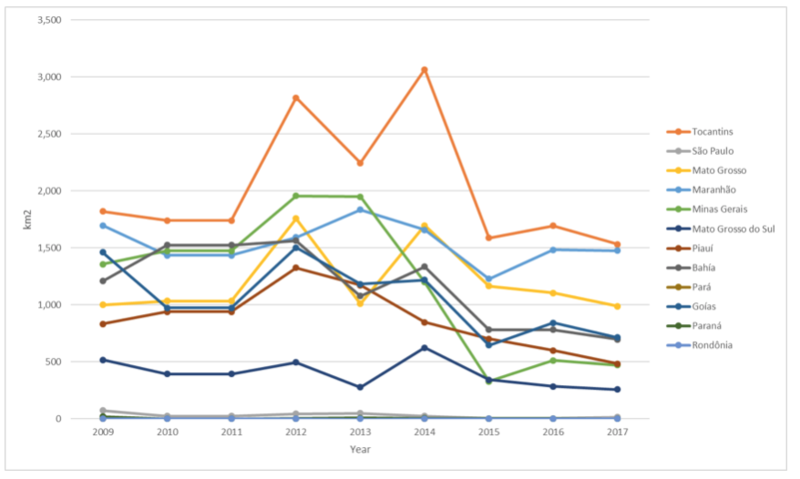 Nearly half of these embargoes are linked to illegal deforestation in protected areas or in areas where authorization is pending. In addition, IBAMA fined nine companies and farm owners for deforestation in 2018, totaling nearly BRL 12 million (USD 3.08 million). Among them is Diamante Agricola S/A (see ‘a’ in Figure 11), the third largest warehouse facility in the municipality. The company received a fine of BRL 6.2 million (USD 1.6 million) in May 2018 for exploring or damaging native vegetation or planted native species. Besides deforestation, land disputes and slave labor also likely occur in the municipality. For instance, Diamante Agricola S/A appears in the Transparency List on Contemporary Slave Labor. In December 2018, two persons were murdered in the municipality, allegedly related to a land dispute. Zero-deforestation efforts in this municipality are relevant given that 67,097 ha of native vegetation could still be legally converted (outside the legal reserves). Soy is also the key crop grown in Campos Lindos, the municipality bordering Maranhão in the east of the state. In 2017, Campos Lindos produced 128,790 metric tons of soy occupying a total of 40,500 ha of land. Warehouses of Brazil’s major soy traders, including Agrex do Brasil, Cargill Agricola, Bunge Alimentos, and ABC Indústria e Comércio S/A, are concentrated in Campos Lindos (Figure 13). With 49,100 metric tons capacity, ABC Indústria e Comércio S/A owns the largest warehouse facility in the municipality. Cargill is the second largest with 29,420 metric tons. Cargill Agrícola is the largest exporter of soy in Campos Lindos. The company accounted for 95.7 percent of the total soy exports in the municipality in 2017, most of which went to China. The company operates three silos in adjacent municipality Balsas in Maranhão. 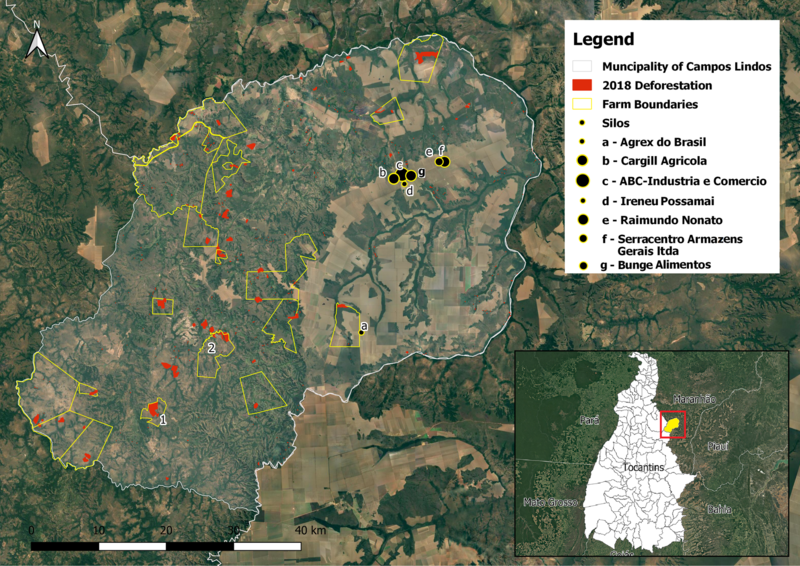 Five farms in Campos Lindos are responsible for 22 percent (431 ha) of the total deforestation of 1,932 ha in the municipality in 2018 (Prodes and GLAD). The Brazilian Ministry of Environment classified sixty-four percent of the loss is classified as forest. The remaining 36 percent is considered grassland formations. Deforestation is gradually shifting to the southwest of the municipality, where more development could still occur (Figure 13). Nineteen properties in this municipality, totaling 2,075 ha, are under embargo by IBAMA. Nearly half of them are involved in the removal of native vegetation in permanent preservation areas or legal reserves. Other properties were embargoed for destroying forests or other types of native vegetation without authorization of IBAMA. A portion of the 2018 deforestation that took place on cattle ranches may be present in the indirect supply chain of large meatpacking companies JBS and Masterboi. Guia de Trânsito Animal (GTA) data that tracks cattle from the ranch to the slaughterhouse suggests that two farms (see 1 and 2 in Figure 13) have sent cattle for fattening to Fazenda Bebedouro in Itacaja (Tocantins). Cattle from this farm has in turn been supplied to Masterboi’s slaughterhouse in Nova Olinda (Tocantins) as well as to JBS’ slaughterhouse in Araguaína (Tocantins). Masterboi’s slaughterhouse in Nova Olinda has not signed the legally binding Terms of Adjustment of Conduct (TACs) with Brazil’s federal government. Through these agreements, signatories have committed to buying cattle from only ranches free of Amazon deforestation since 2009. The Nova Olinda slaughterhouse ranks “high” regarding risks associated with deforestation based on the characteristics of the buying zones. JBS, the largest meatpacker in Brazil and a TAC signatory, has the highest deforestation risk of all meatpackers that operate in the Amazon. Its Araguaína meatpacking plant has a medium-high exposure to deforestation risks. Zero-deforestation efforts in this municipality are relevant given that 62,200 ha of native vegetation could still be legally converted (outside the legal reserves). Zero-deforestation commitments for soy from the Cerrado have gained momentum. The Cerrado Manifesto, published by civil society groups and supported by 74 large companies, urges supply chain actors to strengthen the implementation of their zero-deforestation commitments. In addition, a number of large institutional investors signed onto the Cerrado Manifesto. The signatories of this Statement of Support are looking to expand the Amazon Soy Moratorium to the Cerrado Biome, and negotiations with trading associations are currently underway. Tocantins is one of the states where the risk of non-compliance with such commitments is elevated. Soy from Tocantins carries a high deforestation risk, both legal and illegal. 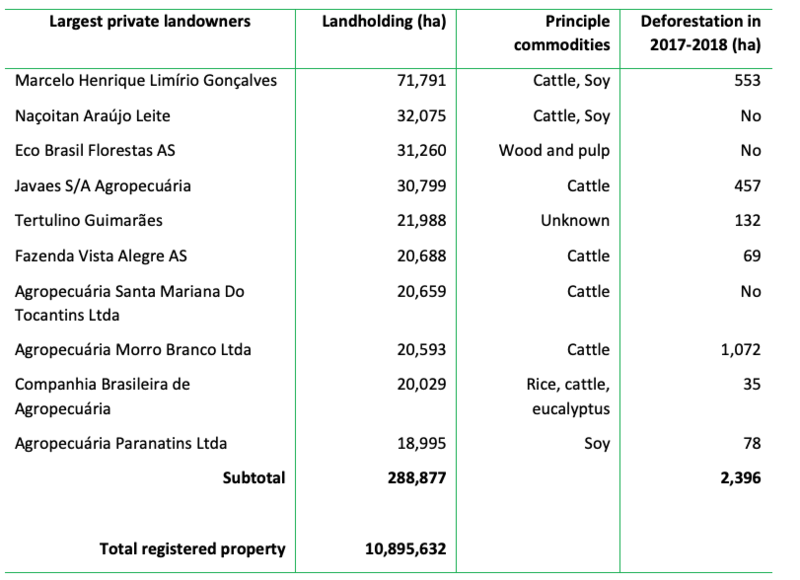 Moreover, key actors in the soy value chains in Lagoa de Confusão and Campos Lindos have seen multiple environmental and socio-political controversies. It is highly likely that similar controversies also exist in other major soy areas in Tocantins. The largest soy traders in Tocantins, including ADM, Amaggi, Bunge, Cargill, Cofco, Louis Dreyfus and Glencore, may face elevated deforestation risks in their Tocantins supply base. Deforestation in their supply chains may expose them to various business risks, including reputation risks, market access risks, stranded asset risk and cost of capital risk. Beef retailers in Brazil may be exposed to deforestation risks in their indirect supply chains. Large beef retailers operating in Brazil include Carrefour, Cencosud and Casino/Grupo Pão de Açucar. They all source supply in Tocantins and therefore may be exposed to heightened reputation risks present in non-transparent and indirect supply chains. Enhanced implementation of zero-deforestation commitments may mitigate such risks. Such enhancements may include the disclosure of supply chain data, stricter enforcement of non-compliance mechanisms, and continuous monitoring of land use change, both legal and illegal.